With the support of Oxfam’s Gender Experimentation Fund (GEF), BRIDGE – Innovation and Development launched an initiative aiming at strengthening gender inclusiveness in development projects. 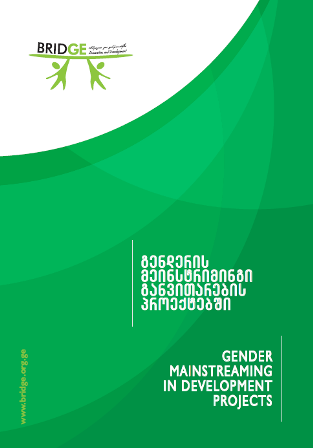 In the framework of the project the Organization developed sectoral gender mainstreaming tools with an aim to effectively advocate for gender inclusiveness in national policy-making process. Furthermore, BRIDGE develop different training modules intended to various actors and stakeholders with an objective to enhance gender mainstreaming. BRIDGE is devoted to gender equality principles and focuses on ensuring equal opportunities for all gender groups in its development projects.